As our engineered wooden flooring boards are sanded to 120 grit then only a light quick sand will be required before applying the oils, in certain circumstances you will not need to sand at all. To get the unfinished look on any of our unfinished oak flooring you should use the wood flooring environment which is unique in the market and it is also non yellowing. Blanchon coloured Hard Waxoils are popular due to the drying times, great colours and ease of application. More durable than standard oil, they can be used on any internal joinery, 1 coat on any area not taking foot traffic, 2 coats on flooring. All in one staining and protection makes for a quick, cost effective and easy solution. Quicker drying than most other hard waxoils, harder wearing and more depth of colour than standard floor oils. Sufficiently liquid to work into the grain well and emphasise the natural beauty of the wood. Simple two coat system whatever the colour to create limed, old english, smoked or other effects. A wide range of 12 natural colours - whites, greys and oaks through to walnut & black. All colours are as easy to apply as the clear, and mixable for colour matching. Conforms to the European Toy Safety Standard EN 71.3, a genuine durable finish with a rich depth of colour. Handy 250ml sample pots for colour testing. This is a water based oil which leaves the wood looking unfinished, and dries in 1 hour per coat, 3 coats. It also carries the Ecolabel, the only pan European certification for genuinely environmentally friendly finishes. Blanchon Wood Ageing Agent is a unique product that reverses the grain and artificially ages flooring and internal joinery, producing a distressed look in an exciting range of 11 colours. These colours range from silver, ash grey and platinum through to old english, wenge and distressed oak, giving the opportunity to create finely matched interior schemes. Once applied, you will see the Ageing Agent react within 10-15 minutes, instantly producing a characterful appearance. Once dry, you can protect with clear Blanchon hard waxoil natural, or with any of the 15 colours of Blanchon hard waxoil to create stunning multi toned looks, with the contrasting hard waxoil colours providing colour relief in the grain. The possibilities are endless, by combining lighter coloured hard waxoils oils with any of the ageing agents, or by combining the dark ageing agents with dark coloured hard waxoils for a deep warm colour finish. This is a water based agent. similar to a lye, but in a range of 12 colours from silvers to distressed oaks. You can overcoat with a hard waxoil, either to create a contrast in colours or just clear oil. This is a unique product on the market, totally up to the minute in terms of distressed and grey floor fashions. Leave to dry for 3-4 hours and see it reverse the grain and create an instant aged look. Try any colour with a clear hard waxoil on top, or distressed oak plus white grey hard waxoil or rough timber hard waxoil. For a fumed look, try ash grey plus clear hard waxoil, always 2 coats of Hard Waxoil on top of the Wood Ageing Agent. Two coats of Blanchon Hard Waxoils, either of the same colour or use one colour as a base and another on top. One coat (or more if necessary) of Blanchon Wood Ageing Agent followed by two coats of Blanchon Hard Waxoil Natural. One coat of Blanchon Wood Ageing Agent followed by any light colour Blanchon Hard Waxoil, then two coats of natural, to product a two tone effect. Good examples of combinations include Wenge Wood Ageing Agent + Walnut Hard Waxoil, Silver + White Grey, Distressed Oak + Old White. The key for option three is to apply the contrasting Hard Waxoil colour (say white grey) thinly, then re-dilute with Hard Waxoil clear immediately or after half an hour, this is because the light oil will look messy and the re-dilution with Hard Waxoil Natural will leave the light colour only in the grain, thus creating the contrast. Options 1 & 2 are easier to do. In fact the options are infinite and we can achieve exactly what you want with experimentation on our unfinished flooring. The unfinished wooden floor you have purchased from us is factory sanded to 120/150 grit abrasion, and if the floor is glued and laid as a floating floor ensure the installer glues the bottom of the tongue only to eliminate glue marks on the surface. It is always best to glue the floor directly to concrete screeds. You should ensure that the fitter is professional and works cleanly. If you are gluing the floor directly to concrete with one of our recommended adhesives then you should have no problems, as you do not need to glue the tongue and grooves together. The application of the WOCA oils can be applied either with a hand Roller/ Brush or lint free cotton cloth, or by a buffing machine (15-18inch diameter). APPLICATION BY HAND: Inspect the floor to ensure that it is free from marks or glue on the surface, if necessary use a 120 grit sandpaper to rub away any marks or the glue spot along the grain back to bare wood. 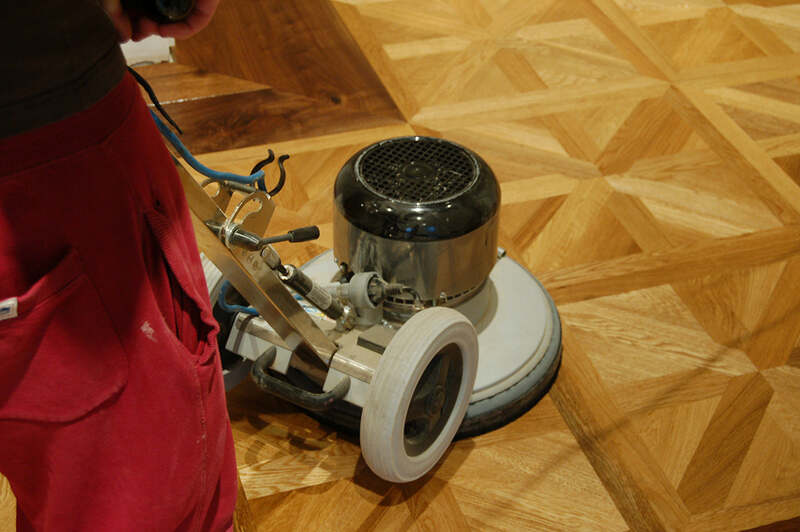 Practical hint: If there are a lot of glue marks, wash the floor with a damp cloth, and the bare wood surface will darken, any areas with glue marks will remain light, re sand these areas and so on until the floor is perfectly clean and dry. The WOCA oils must be fully stirred, mixed and shaken prior to application to ensure the colour pigments are full dispersed. Stir with a wooden stick to fully ensure the integration of the colour pigments. If the oil is not mixed correctly then the floor could become patchy with different colours from the start to the finish. Apply the oils as per the instructions on the canister with a short hair roller, brush or Lint free cotton cloth. Allow the oils to penetrate the surface (approximately 15 minutes) and wipe dry any excess oil from the surface. VERY IMPORTANT- EXCESS OIL: Because WOCA oils are oxidising oils, any excess oil left on the surface will be cured by the oxygen in the air. This means that the excess oil will become sticky and will prevent the oil that has penetrated the surface to cure properly. The oil within the wood will cure over the next 24 hrs. Approximately 24 hours after the application of the oil inspect the floor for colour harmonisation and if satisfied soap the floor with either the WOCA soap or Oil Refresher as per the instructions on the canister with cotton mop. Once the floor is dry it is ready for use. APPLICATION BY MACHINE: Machine application is done usually by a 15 -18 inch buffing machine with a white or green buffing pad and is quicker and ensures full saturation of the oils (which is the objective). Inspect the floor as above and mix the oil as above. The oils are applied to the floor and buffed in with the white or green buffing pad. Allow the WOCA oil to penetrate the wood surface (15 minutes) and wrap a clean lint free cotton cloth around the buffing pad and machine wipe dry any excess oil from the surface and allow the oil to cure overnight. Inspect for colour harmonisation and soap the floor as above. NOTE: If you apply the oils with a buffing machine you have the opportunity to create the very best oiled floors by using the WOCA patina disc on the buffing pads during oiling please ring 01453 844675 for further details or see the web site for PDF downloads with full instructions.